Less than 100 miles from the Trinity site where the first Atom Bomb was detonated, history of another type is being made. Alamogordo Public Schools has made a major financial commitment to install the largest renewable energy HVAC system in the South-western United States. Ground-coupled heat pumps have been applied for over two decades, but more recently the term “Geothermal” has been used. Since the earth’s constant temperature is used as a condenser for the cooling system it is considered renewable energy. Yet this project is unique in many more ways, due to the comprehensive design that integrates a Delta Controls DDC system with Geothermal Heat Pumps and a District wide lighting retrofit. Alamogordo Public Schools serves a wide-ranging student community in a thriving municipality located in South Central New Mexico. Alamogordo is situated with the Sacramento Mountains, including the Lincoln National Forest and the country’s southernmost ski area, as its backdrop. The District includes 15 schools with three serving Holloman Air Force Base, home to the Stealth Fighter Wing, and White Sands Missile Range. This project focused on the District's desire to optimize the learning environment through effective temperature control, but they wanted more. Dave Flood, Alamogordo Director of Operations and Superintendent Dr. Phil Knight focused this project on the high school due to critical issues at the facility. The high school was constructed in phases and there were six different mechanical systems with corresponding control technology. The district also wanted to look at improving the lighting systems. Energy Control Inc. (ECI), an Energy Service Company and the local Delta Control Distributor was called in to evaluate the High School, but also given the liberty to evaluate other schools in the district. The goal was to upgrade the high school to one standardized system for both mechanical equipment and controls. Dave Flood and Superintendent Dr. Phil Knight had done a great deal of research, but the budget would not support their vision for the project. Energy Control Inc. was asked to conduct an energy engineering study to evaluate controls, the earth heat exchanger required for the heat pump system. ECI was asked to complete turnkey project implementation and assembled a team including Enlink Geoenergy, due to their expertise in earth heat exchanger technology. Jim Coupland, P.E. was hired by the district to act as the owner’s engineer. The Geothermal system incorporates traditional water source heat pumps familiar to engineering design professionals. Key changes to the units are larger condensers to accommodate wider temperature swings on the ground loop and higher efficiency compressors. The critical component is the earth heat exchanger and it consists of a series of piping loop in boreholes buried underground. A borehole is drilled, and then a polyethylene piping-loop is inserted and grouted to develop thermal conductivity with the earth. The ground loop is interconnected between boreholes using a reverse-return piping scheme. This systems efficiency is further enhanced with make up units using air-to-air energy recovery. These energy recovery units employ heat wheel technology and a sequence of operation, which enables unit operation based upon carbon dioxide (CO2) and occupancy. Finally this project provided a heat pump with DDC in each classroom. The first project phase encompassing 400 tons of cooling will be complete in summer 2004, and the next phase will begin in spring 2005. Lighting upgrades are common in public schools, and an effective way to reduce operating costs. Operations dollars are also saved because a group relamp addresses lighting in all schools at one time. This retrofit upgraded T12 lamps and magnetic ballasts to T8 lamps with electronic ballast technology. A Delta Controls DDC system was designed to optimize daily and annual schedules, and ensure comfortable learning environments during normal school hours. The Delta system also provides knowledge tools necessary to perform savings measurement and verification. ECI performed energy analysis and design along with the financial evaluation to determine the feasibility of supplemental funding. Delta Controls systems were implemented in all four schools along with sub-meters on major electrical loads, to allow ECI to measure energy consumption after the project and verify savings. Delta was the ideal choice due to the sophistication of the DDC technology and because it employs BACnet®™, which will position the district for the future. BACnet® will afford Alamogordo Public Schools maximum flexibility and cost-effectiveness by making it possible in the future for control products from Delta and other manufacturers to be integrated into a single, uniform system. BACnet® is designed to allow HVAC/R, lighting, life safety, access, security, power, vertical transportation and other building system control devices to interoperate. 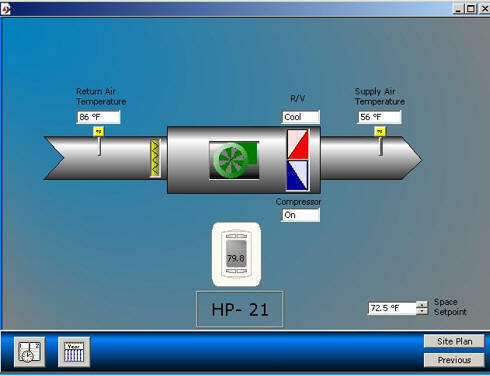 At Alamogordo, building wide control was achieved through application of Delta systems at each heat pump, as well as energy recovery make up air units and on the earth heat exchanger ground loop. The system controls the ground loop for maximum efficiency based upon demand, flow and energy consumption. 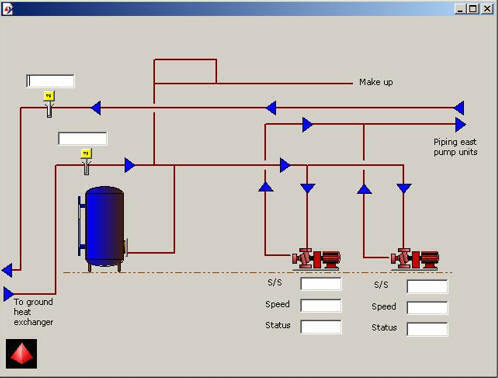 As noted this project uses reverse-return piping, but approaches may vary and the graphic above shows a bore field with another piping scheme. Variable frequency drives on main loop pumps are controlled by a DAC1212 controller for optimum performance with control sequences that monitor entering and leaving water temperature on the loop, as well as load throughout the building. The energy recovery units, designed to efficiently meet ventilation requirements for classrooms, are controlled by DAC 633, based on time of day and air quality from CO2. The heart of this system is the classroom learning environment, and individual heat pumps are controlled by DAC606’s with BACstat’s. Unit sequences control each stage of cooling along with reversing valve and fan. They also monitor classroom space temperature and discharge air from the unit, plus a number of alarm points to allow quick response to problems. Another benefit of this system is local control with a BACstat providing teachers with the ability to change temperature setpoints in the classroom with a four-degree dead band. Teachers appreciate being able to control their own space, they can see the actual room temperature and have after hours override from the BACstat. If a teacher works late, or comes in Saturday, they don’t have to search for a maintenance person to turn on the heat, they just push a button. This system offers the power of BACnet®™ and ORCAview 3.3, an industry-leading operating package combining an intuitive graphical user interface with powerful facility management capabilities. ORCAview includes the Navigator an object-oriented system navigation and operation tool, and provides the Illustrator graphics editor for creating customized system graphics, such as those shown here. ORCAview provides monitoring and control of functions for the Alamogordo system and protects against unauthorized access. ORCAview communicates using BACnet® ™ data structures and communication services for Delta and third-party BACnet® products. 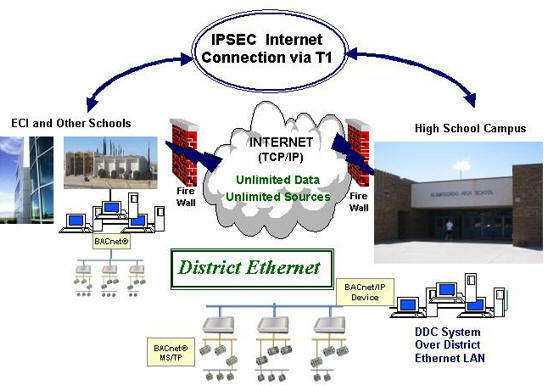 At Alamogordo Public Schools ORCAview uses BACnet® IP™ to communicate over the Internet and the District local area network to connect to any of the four schools. 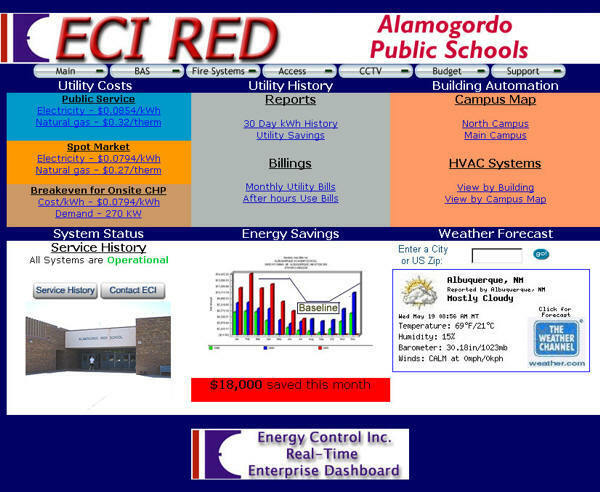 This technology is a hallmark for ECI, who won a 2004 “Buildy Award” at the Builconn Forum for the “Best Integration Project in North America.”Intelligent" building technology was applied in Alamogordo including a Real-time Enterprise Dashboard™ allowing district personnel to view the Delta system and offering other facility management features. From this Internet portal the district can get access to building system data and also monitor utility costs for measurement and verification. Even more exciting the district can contact ECI to request service via email. After receiving the email service techs will visit the site and update a web-based service database when work is complete. The customer can visit the site later in the day and get the status on that task and all other service work. Technology was not the only challenge with this project however. In the public school world financing is always a challenge, and this was project was no exception. Traditionally public schools have relied on a single source of funding, such as a state appropriation, to make projects possible. Across the country however, school districts are approaching their debt capacities and also finding that there are limited funds from any of the traditional sources. Alamogordo Public Schools asked ECI to aide the district with supplemental funding to move the project forward. The approach was to use performance contracting and ECI worked with Neal Skiver to finance part of the project with a 10-year tax-exempt municipal lease purchase from La Salle National Bank. $5,000,000 million in General Obligation bonds. ECI developed and facilitated the performance contract including financing. This is clearly a bellwether trend for public sector funding, and in the future combining funding sources will become a requirement, rather than a novelty. The creativity applied in crafting technical and financial solutions for this project has resulted in a great deal of recognition. It is a testament to tenacity of Dave Flood and Dr. Phil Knight that they pursued efficiency and renewable energy to meet district needs, and that they sought out ECI for a turnkey solution. As a result of this leadership Alamogordo Public Schools received a “Renewable Energy Leadership” award from the National Renewable Energy Laboratory and an “Environmental Energy Leadership” award from the Department of Energy in July. They have received an “Energy & Environmental Project of the Year” Award from the Association of Energy Engineers chapter and were nominated for a Green Zia Energy and Environmental Excellence Award. It comes as no surprise that Alamogordo Public Schools is committed to excellence in education, quality of construction, facility operations, energy efficiency and creating a great place to learn and work. Through this project Alamogordo Public Schools has taken a strategic approach to energy and environmental management with impressive results. The initial phase implemented $2.4 million in technology and generated dramatic savings. Annual savings are 1,245,472 kWh of electricity in a service territory with a blended cost per kilowatt-hour of $0.14. The environmental benefit of avoided power plant emissions for that electricity is 19,928 pounds of sulphur dioxide (SO2) and 184,330 pounds of carbon dioxide (CO2). By eliminating evaporative cooling in parts of the high school they will also save over 4 million gallons of water per year. This project is truly unique; from the financing mechanisms that were necessary to make the project possible, to effective DDC for the geothermal technology. Delta Controls was key to the success of the project, and will continue to ensure that the district achieves the energy and cost savings necessary to service the debt, while optimizing the learning environment.